What do you recall of 1816? In the UK George III was on the throne, Sir Humphrey Davy’s safety lamp was being tested, Charlotte Bronte was born and the Elgin Marbles were purchased by the British Museum. Whilst further afield a damp summer in Switzerland led to Mary Shelley penning Frankenstein. For most of Europe and a lot of the rest of the globe however it was the summer that never was. In Ireland and Wales as elsewhere in Europe heavy rain and cooler than average temperatures brought about the failure of crops and famine set in on a massive scale. The cause? The world’s biggest volcanic explosion, not as often assumed, Krakatoa which erupted in 1883 but Tambora on the island of Sumbawa, Indonesia which erupted in April 1815 sending vast amounts of dust into an already dusty atmosphere following a succession of other large volcanic eruptions in the previous decade. 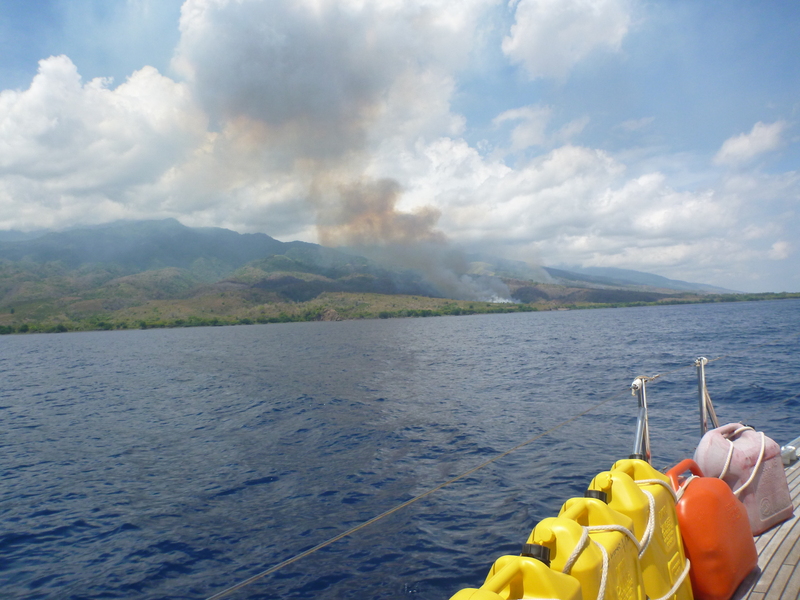 According to scientists the eruption reached a massive VEI 7 on the scale of explosivity, four times more than Krakatoa which achieved a mere 6. A column of debris reached over forty km into the air. The immediate impact on the island was the loss of an estimated 71,000 lives and a metre thick layer of ash that covered an area 75 km radius about the volcano. The global impact took a few months to develop and by the northern hemisphere summer of 1816 the results were dire. Scientists believe the earth was at least one degree centigrade cooler due to the ash cloud that surrounded it. The eruption itself was described by Sir Stamford Raffles, founder of Singapore who was then governor of Java so in Batavia, modern day Jakarta and believed at first from the noise they were under attack so despatched troops. Jakarta is 780 miles away! Today Tambora sleeps; almost 3000 metres high (it was once over 4000m) with several mini, classically shaped volcanoes on its slopes like carbuncles. The last eruption was in the 1960s. 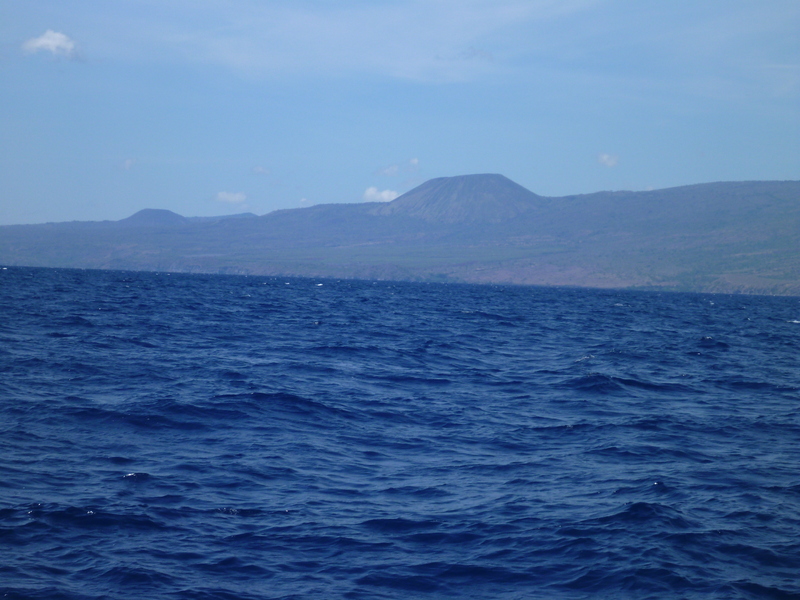 So vast is Tambora that took us most of the day to sail (well actually mostly motor) past its massive seaward side on the island of Sumbawa. The scenery was impressive; steep wooded sides, an uncharacteristic flat top presumably due to the 1815 eruption, with black sand beaches below low cliffs at its foot. An amazing sight with an incredible impact on world history.